Nathanson creates an environment that is welcoming to everyone, regardless of shape or background. Sarah Moosazadeh is a staff writer for the Atlanta Jewish Times. Desiree Nathanson teaches a fitness course at her new studio, Interfusion Fitness. Judaism and fitness were entwined for Desiree Nathanson growing up in Sarasota, Fla., and inevitably led her to open her own studio, Interfusion Fitness. As the daughter of a cantor, Nathanson frequently accompanied her mom to synagogue and often served as a backup. But in addition to attending synagogue, Nathanson’s parents worked out every day. After dancing with the University of Florida Dazzlers, Desiree Nathanson went on to become an A-Town dancer for the Atlanta Hawks. “I think that subconsciously shaped me and got me to where I am today,” she said. Nathanson’s father had a stroke before she was born. He was left partially paralyzed but continued to work and took on the role of a stay-at-home dad, doing the laundry, cooking, and driving Nathanson to dance recitals and Hebrew classes. “My father’s disability influenced me to be more inclusive of others in fitness and provide them with the opportunity to participate. My parents also made it a point to always have dinner as a family, which helped me realize the importance of bringing people together,” Nathanson said. She began dancing at 4 years old when her parents enrolled her at a YMCA. She later moved to Florida Ballet Art, where she spent two to three hours a day, six days a week, practicing jazz and modern dance. By the time she entered high school, Nathanson was burned out. She quit the recitals but later returned to dance school. 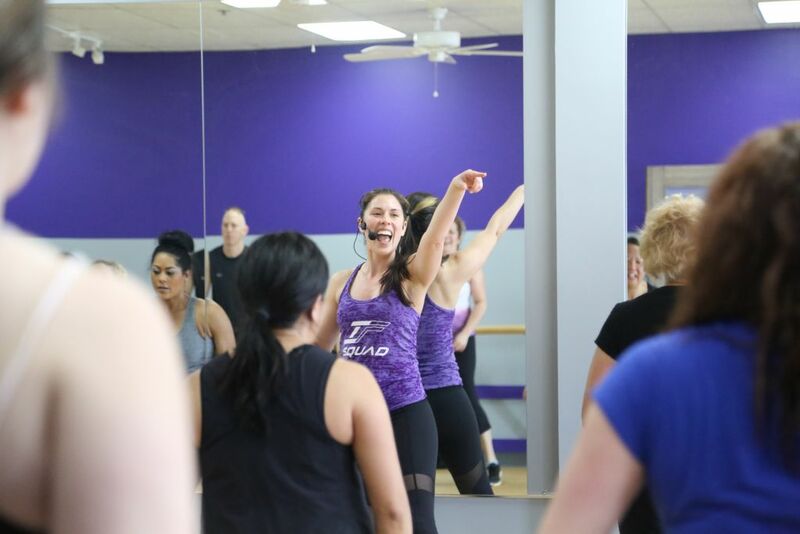 After graduating from the University of Florida, where she joined the Dazzlers dance team, Nathanson became the official trainer for the Atlanta Hawks dance team. During her third year as an A-Town dancer, Nathanson’s old coach from Florida, Donni Frazier, asked whether she would be willing to train the Hawks’ team after she judged a few auditions and choregraphed some workouts. Nathanson remains a member of the team, occasionally serves as a backup host during games and trains boot camps twice a week when her schedule allows. Before acquiring her own studio, Nathanson taught for nine years at another location and offered personal training sessions alongside her fiancé at private homes. After an old talent agent asked why she hadn’t opened her own studio, Nathanson began looking for space. Since opening Interfusion Fitness in Brookhaven, Nathanson has been determined to create an environment that is welcoming to everyone, regardless of shape or background. In addition to serving as a member of the board of the Eating Disorders Information Network for a third year, for which she participated in a celebrity dance challenge and won the judge’s choice award, Nathanson has written her own health and wellness book, “Formula 5: The Five F’s to Better Health,” has been involved in Atlanta Pride, and looks forward to partnering with Jewish organizations to help raise awareness of the importance of fitness. Nathanson’s strong connection to Judaism and passion toward fitness have remained with her throughout her personal life and career.